In which Shells takes a much needed break. I finished the dream in color scarf and realized that the yarn for the last project has not yet been delivered. What is to be done then but some work on things I like to do? I did a bit of knitting on my tangled yoke cardigan, I brought it to the place where I need to start the sleeves. I also finished a spinning project that has been on the bobbins for quite some time now. 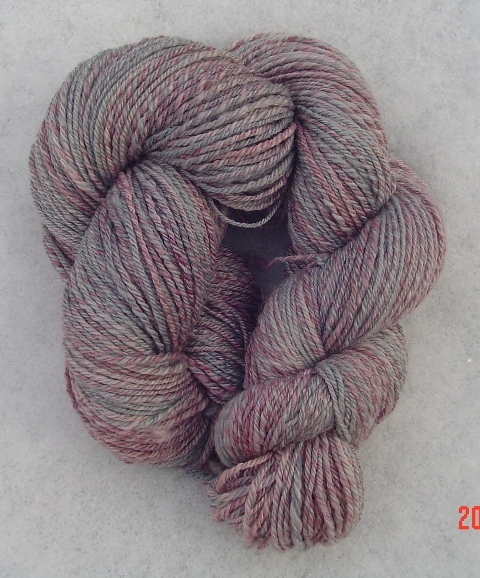 313 yards 3 ply sock weight yarn which I call “Pink Granite.” The fiber content is 60% merino, 40% bamboo. Shown in the first official snow of the season! I have to admit, I was somewhat reluctant for the yarn to arrive. Alas, it did, so the next project must begin.